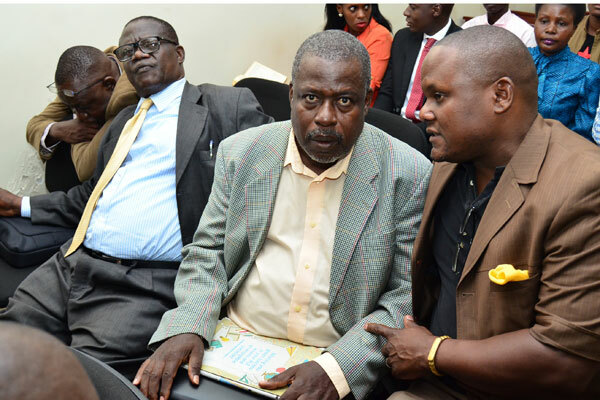 KAMPALA- Jailed Ex-UNRA finance chief Joe Ssemugooma and businessman Apollo Senkeeto who were last month convicted of causing financial loss to the government of Shs24.7 billion have filed a notice to appeal against their sentence. Justice Lawrence Gidudu last month sentenced Ssemugooma to a 5years jail term for corruption and Abuse of office while Senkeeto alias Mark Kalyesubula who was the country representative of Eutaw Construction Company, which he is accused of fleecing UNRA of Shs24.7 billion in the bungled Mukono-Katosi road contract to 10years. The two out of the three that where convicted have now filed before the Court of Appeal a notice of intention to sue. “Take notice that the respondents being dissatisfied with the decision of Justice Lawrence Gidudu given at the Anti-Crruption division of the High Court of Uganda on August 29, 2018 intends to appeal in the Court of Appeal against the whole decision,” reads in part the notice of appeal. Senkeeto who was described by court as being the architecture of this fraud and Ssemugooma were part of 5 other people, including former works and Transport minister Eng. Abraham Byandala, former UNRA Executive Director Eng. Berunado Ssebuuga, UNRA legal advisor Marvin Baryaruhuha and a one Isaac Mugote who were acquitted by the same court on similar charges . In their notices and memorandum, the two have stated 12 grounds on which they are basing to contest the judgment of Justice Gidudu, who found them guilty. These who are already serving their sentences at Luzira prison among other grounds are faulting justice Gidudu of failing to adequately evaluate IGG’s evidence against them and there by wrongly convicting them of stealing the Shs24.7 billion yet he (Gidudu) had observed that there was no road audit report brought before court to ascertain the actual amount of money lost in the Mukono Katosi-Nyenga Road saga. The two convicts also claim that since court acquitted all the suspects on the charge of causing financial loss, it was unfair to convict any of them in relation to theft of the same money. Through their lawyers of Mulira and company advocates and capital law partners, Senkeeto and Ssemugooma are asking the court of appeal to overturn Justice Gidudu’s judgment and acquit them too of the charges. The other convict; Wilberforce Ssenjaako who was also sentenced d to 5 years for has not yet filed a notice of appeal.